Volkswagen Chief Says Recall Of Affected Cars Could Start By January, The new chief of embattled carmaker Volkswagen said the recall of diesel cars affected by the pollution cheating scandal could start by January and end by the end of 2016. Berlin: The new chief of embattled carmaker Volkswagen said the recall of diesel cars affected by the pollution cheating scandal could start by January and end by the end of 2016. "We will this week present our proposals for technical solutions to the Federal Motor Transport Authority," Matthias Mueller told the Frankfurter Allgemeine Zeitung daily in an interview published today. "If these are accepted, we will order the parts. If all goes off as expected, we can start the repairs in January," he said. The work on all cars could be finished by the end of next year, he added. Volkswagen, which this year became the world's biggest carmaker by sales, has admitted to fitting 11 million vehicles with so-called defeat devices which detect when a car is undergoing testing and switches the engine to a low-emissions mode. It turns off this mode when the car is back on the road, allowing it to spew out far higher emissions than permitted. Matthias Mueller said "four people, including three responsible directors on different levels of the development of Volkswagen engines" have been suspended over the deception, adding that "others were already on partial retirement". German press have named Audi's development chief Ulrich Hackenberg among those suspended, although Volkswagen would not confirm the information. Matthias Mueller said he did not believe that the management team of Martin Winterkorn, who was forced to quit as chief executive at the height of the scandal, could have been aware of the scam. "Do you really think that a boss would have the time to be concerned about the details of engine software?" he said. The development of an engine is "a complex process that involves interaction between programmers, engine developers and gearboxes and those who deal with measurements for official tests," he said, adding that these are tasks in which "a director is not directly implicated". Most of the vehicles affected would only need a minor adjustment in their engines but some would require major intervention, adding that these would be "of course carried out free of charge," said Mueller. He said the group would launch a huge cost-cutting programme and review several projects including its investments in football. It owns the VfL Wolfsburg football club and has investments in 17 professional clubs. Earlier, in a speech to 20,000 staff at the group's Wolfsburg headquarters, Mueller said the 6.5-billion-euros ($7.3-billion) provision the company had set aside in the third quarter due to the scandal was just the start. "It includes the estimated cost to fix the affected vehicles," he said. "But it won't be enough. We must prepare for significant penalties." In the United States alone, Volkswagen faces up to $18 billion in fines from just the Environmental Protection Agency, plus potential payouts from class action lawsuits and fines from other regulators. interview: "Think about this: no one died from this, our cars were and are safe." Matthias Mueller also told employees the company will fight to limit the fallout on its workforce of 600,000 at over 100 plants worldwide. 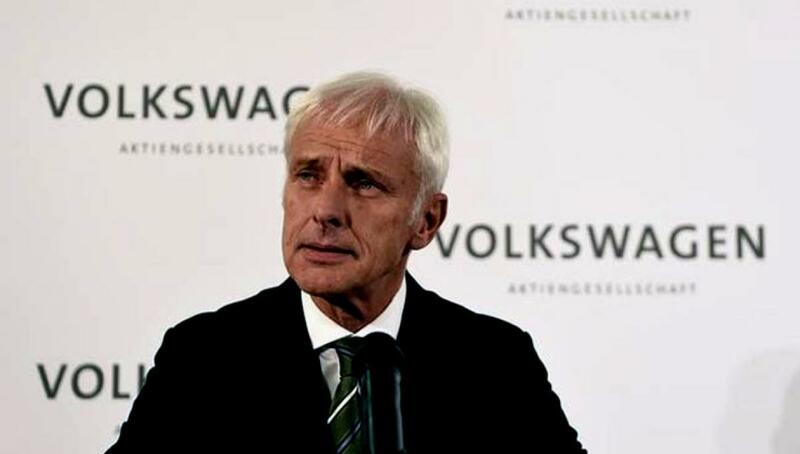 "As for jobs at Volkswagen: We still do not know today what impact the crisis will have," he said.